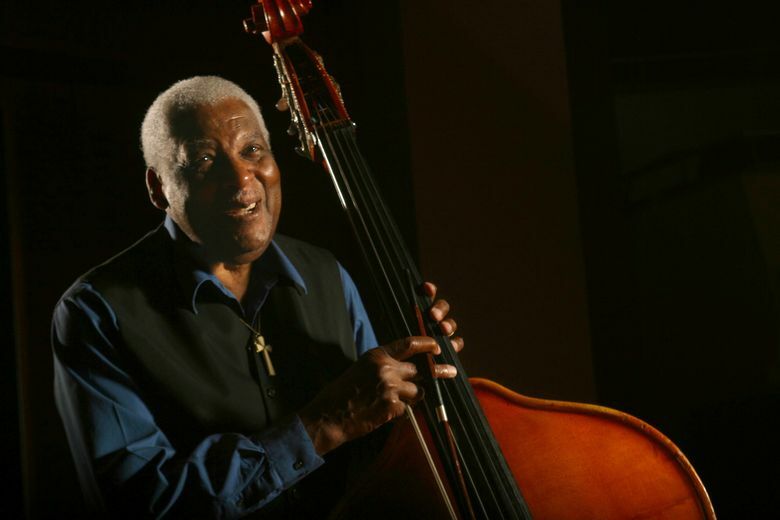 The bassist, who started his career playing alongside jazz greats such as Ella Fitzgerald and John Coltrane, also had a deep and abiding love for classical music. Born in Harlem, he died in Bothell on Aug. 31, 2015. Bruce Lawrence, the first African American to join the Seattle Symphony, and who started his career playing alongside jazz greats such as Ella Fitzgerald, John Coltrane and Mary Lou Williams, has died. He was 88. Mr. Lawrence died Aug. 31, in the home that he shared with his wife, Josie, in Bothell. While he got his start in jazz, he preferred classical. “He loved Bach. That’s what he listened to, always,” said Josie Lawrence, 65. He grew up in the tony Harlem neighborhood of Sugar Hill, a few doors down from Sugar Ray Robinson, the boxing legend. During the 1950s, Mr. Lawrence played the bass with the aforementioned giants of jazz. But it was his father who exposed him to classical music’s sweeping sonics. Mr. Lawrence initially studied piano but a teacher suggested he switch to the bass. “A music instructor in school told him because of his hands he should play the bass. He had real strong, big hands,” Rasmussen said. Mr. Lawrence had a decorated musical career. In New York, he attended the illustrious High School of Music & Art, followed by two years at the prestigious Juilliard School, focusing on bass. Before coming to Seattle, he played in the Ottawa Symphony, the Canadian Broadcasting Corporation studio orchestra, and the Syracuse (N.Y.) Symphony. His daughter Idelle held up the phone for him in Syracuse while he auditioned for the Seattle Symphony. “The next thing I knew, we were headed to Washington,” she said. But, said his friends and family, Mr. Lawrence was humble to a fault. Mr. Lawrence left the symphony in 2005 and dedicated his time to working with young people in cities, exposing them to the music and the instruments he loved so much. He started a string orchestra at Leschi Elementary School in Seattle, and worked with students at Seattle’s Langston Hughes Performing Arts Institute and at Garfield. He met his last wife, Josie, at a jazz show at the Black Angus in Shoreline, while still wearing his formal tailcoat. They married two years later in 1990, and again in 1998. Indeed, Mr. Lawrence had a fondness for getting married, often marrying the same woman more than once. His daughters said he married their mother, Thelma, twice before she died in 1979 ­­— in 1959 in Manhattan and again in 1976 in Seattle. Washington state public records show several more marriages. “That was joked about — I don’t know the real number,” said Schwarz of Mr. Lawrence’s matrimonial history. Along with his wife and daughters, Mr. Lawrence is survived by two sisters, Marie Lawrence of New York and Edith Lawrence of Edmonds. Memorial services will be held at 1 p.m. Sept. 19 at the Seattle Church of Christ in Queen Anne, 2555 Eighth Ave. W., Seattle.